March is the time many motorhomers really start to think about getting out in their motorhomes again after the winter. With the clocks going forward next weekend (Sunday 25 March), bringing the arrival of lighter evenings combined with the prospect of some spring sunshine it can feel like the conditions are right for travelling. 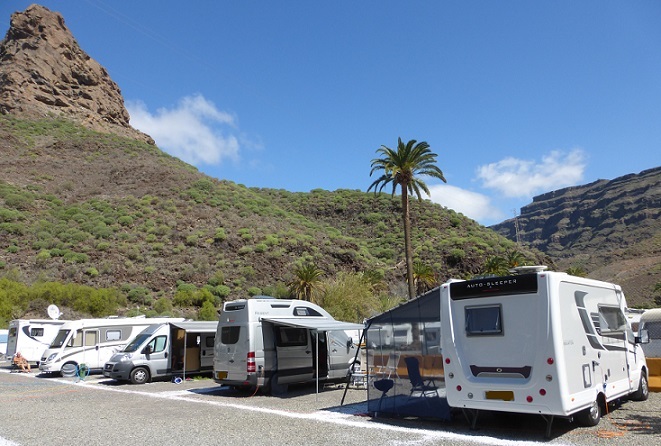 For those on our winter Canary Islands tour they have no such concerns, having already been away for two months they enter the last two weeks of this 70 day tour in continued sunshine. If you would like to enjoy winter sunshine in your own motorhome next year a place on our Canary Islands 2019 tour is still an option. For GB Motorhome Tours March also signals the start of the outdoor motorhome show season with us exhibiting the first weekend in April (6, 7 & 8 April) at the South Coast Caravan & Motorhome show at Broadlands Park, Romsey. The following weekend (13, 14 & 15 April) we are at Brownhills Motorhomes in Newark for their ‘Strictly Motorhoming Weekend’. Then for the largest of the outdoor shows we are at Peterborough for 3 days (20 – 22 April) where we have our stand indoors so whatever the weather do come along and see us. Also on the Sunday morning at 11:00am join us in the main indoor seminar arena where our Tour Director Kevin Griffiths is giving a presentation on escorted motorhome tours. For getting away soon on one of our tours, whilst both the forthcoming Delightful Denmark and An Atlantic Coast Adventure tours are fully booked, if you are quick we can still get you a place on Mosel & Rhine Discovery, Austrian Alps or Emerald Irelandtours, see the end of this email for further details. As you prepare your motorhome for use after the winter it can be an opportunity to also clean the fresh water tank, pipework and taps with a solution of sterilising water, following the system being drained for the winter. This can be achieved by adding some sterilising tablets to your main fresh water tank, allowing them to dissolve and then pumping the water through to all locations by opening each of the taps for a couple of minutes. Leave the sterilising solution in the system for 24 hours and then drain down before refilling with clean fresh water. Water sterilising tablets can be purchased from somewhere like Boots, as commonly used for sterilising babies feeding equipment. If there is anything you wish to ask about our tours feel free to contact us, we are always happy to help and we look forward to escorting you to great places throughout the coming season.